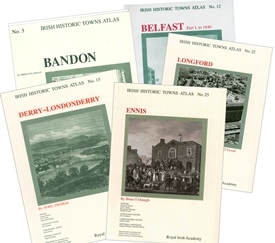 The latest release in the online Irish Historic Town Atlas (IHTA) series is for towns founded as new Plantation towns or as redeveloped Gaelic/medieval towns. These early modern, Gaelic and Plantation towns include Bandon, Belfast, LondonDerry, Longford and Ennis (the Belfast book extendsd to 1840). The IHTA research project is run by the Royal Irish Academy and aims to examine the topographical development of a selection of Irish towns both large and small during key periods in their history. In each volume, clues to the town's past religious life, defence and security, local and national government, industry, trade, transport, education and leisure habits are explored within the accompanying maps. Dense and accurate, these atlases reveal fascinating details about the physical environment and communities our ancestors lived in. Map 1 (Cmid-19th, 1:50,000), Map 2 (Cmid-19th, 1:2500), Map 3 (modern C20th, 1:5000), growth maps, historical compilation maps and legend sheet. With this latest release of titles is the chapter on Early modern, Gaelic and Plantation towns from Reading the maps: a guide to the Irish Historic Towns Atlas (Dublin, 2011) to help the reader contextualise the town type, see different samples from different towns and case studies. The IHTA volumes in this latest release are no. 3 Bandon by Patrick O'Flanagn (1988); no. 12 Belfast, part I, to 1840 by Raymond Gillespie and Stephen A. Royle (2003); no. 15 Derry~Londonderry by Avril Thomas (2005); no. 22 Longford by Sarah Gearty, Martin Morris and Fergus O'Ferrall (2010); and no. 25 Ennis by Brian Ó Dálaigh (2012).